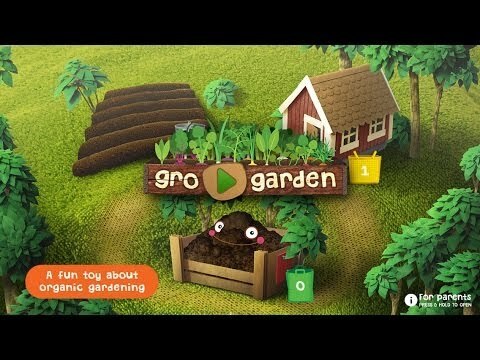 Gro Garden - An organic gardening game, by Gro Play is a great app for April and Earth Day. It's also a great way to get kids learning about organic and sustainable farming. This app has three different components and you may want to check out the directions at the bottom for a clear understanding of how the app operates. Start at the garden, and learn what three things are needed to grow plants: soil, the sun, and water. Experience what helps the seeds grow and thrive by manipulating the sunshine, rain clouds. Eventually, you will find the key component for healthy growth is the maintenance of the soil and renewing its nutrients. Move on to the house and gather scraps, which are fed to the microorganisms in the friendly compost. The compost is where you work to collect nutritious soil to make your crops grow faster. The key is to understand that each activity generates something that is needed in the next step activity or scene. This is exploratory play with lots of trial and error, a wonderful resource for any teacher in the preschool and primary grades to introduce this life cycle. Banja, the rabbit, and his friends are cool characters that make the game all the more fun for kids. There is so much educational content, and more importantly, children are learning at a young age about our precious environment and the magical process that takes place. In this fast paced, apathetic, disposable society that many of us live in, this has become a paramount concern! CELEBRATE and respect our wonderful world with Gro Garden! Learn with Gro Garden - Earth Day and Everyday! The best way to get the game cycle going is to grow some vegetables in the "FIELD SCENE" by sowing seeds. Generate both rain AND the sun by clicking on the clouds and the sun. After you have harvested some vegetables, you should go to the "LITTLE COTTAGE SCENE" to feed the animals and put the food scraps in the waste bag. Then, go to the "COMPOST SCENE" and feed the food scraps to the Micro-organisms. After a while, you can get some nutritious soil from the Compost (the red hatch) which you can use as "booster" back in the "FIELD SCENE" to grow more vegetables. Along the way, you'll earn rewards. For instance, new types of Vegetables and new types of Microorganisms. Your progress / all rewards are saved in your "My Garden badge book" that you can open by clicking the green tab, always present in the upper right corner of the screen.